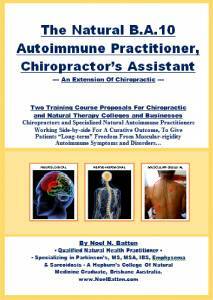 The B.A.10 Autoimmune Practitioner, Chiropractor’s Assistant eBook. An Incredible Breakthrough In Massage Therapy DVD. 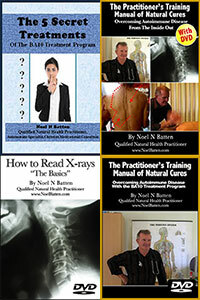 The Practitioner’s Training Manual of Natural Cures DVD. 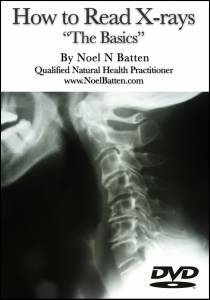 The Practitioner’s Training Manual of Natural Cures eBook. 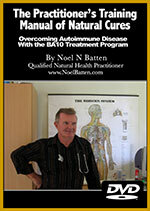 The 5 Secret Treatments eBook. The 5 Treatment Secrets DVD. This Pack of 8 practitioner quality products, supported by my guidance via Skype, is available to autoimmune patients who wish to promote my specialized treatment ideals to a local massage therapist to enable that therapist to use my unique assessment and treatment ideals to help patients reach remission. Whilst I have spent many years researching medical journals and documents on the immune system and autoimmune diseases since 2002, and then treating autoimmune patients since 2005, I have mainly focused on treating patients who were officially diagnosed with Parkinson’s disease and multiple sclerosis because these two disorders reflect the widest range of symptoms, including respiratory disorder, epilepsy, diabetes and optic neuritis. My approach is to ignore any names or titles given to a collection of symptoms that an autoimmune patient suffers from and just focus on which nerves effect each symptom, how high each symptom is in the body, and which of the 10 immune functions that I test in my BA10 assessment, have been compromised to allow the symptoms to develop. If a natural therapist who purchases this Pack of products would like to sign up for my advanced education program to become a B.A.10 Natural Autoimmune Practitioner, the $900-00 fee paid for this pack, will be deducted off the fee of my advanced education program.